Al Robertson explores the capital's live poetry scene and offers tips on where to get started. These days, we tend to think of a poem as being words written down, rather than spoken or sung. That's a real shame, because it stops poetry from moving - and thrilling - as many people as it could, and it makes it far too easy to miss London's really rather wonderful live poetry scene. Live poetry isn't just a modern thing; In fact, for most of its life poetry has been a performance art, not a written one. The Ancient Greeks (and after them the Romans) divided poetry into three types; lyric, epic and dramatic. Lyric poetry was accompanied by the lyre, hence the name; epics would be recited over several evenings to enthralled listeners, while for centuries audiences packed out amphitheatres to see the latest verse dramas. As Classical times came to an end and the Middle Ages began, poetry was still all about performance. Across the world, words were set to music, or chanted; European courts bustled with troubadours of various kinds, while verse drama survived both in local mystery plays and more formal courtly masques. And in London, two of our poetry’s great founding fathers were writing with live audiences very much in mind. Chaucer’s ‘Canterbury Tales’ - profoundly original in their naturalistic characters and plots - were written in part to be read out loud; possibly at court, possibly just to Chaucer’s friends and acquaintances. A couple of centuries later, Shakespeare showed his respect for the fierce intelligence of the London mob with a series of poetic dramas, that - quite apart from their unequalled artistic and commercial success - reinvented the English language for the modern world, live on the stage of the Globe. But, since Shakespeare, we’ve lost that sense of poetry as performance. Most poetry now is read; most of us run into poems as photocopies at school, or on posters on the tube, or in a book pulled from the shelf to fill a quiet night in. Even people who really love poetry tend not to go and see it live. And that’s a tragedy, because poetry needs to be heard. Every poem is built on rhythm and rhyme - ‘the best words, in the best order’, to quote Samuel Taylor Coleridge, whose wonderfully hypnotic poem 'Kubla Khan' is a great one to read out loud. Like 'Kubla Khan', most poems only really come to life when those rhythms, and those rhymes, are allowed to sing out in the air. The Poetry Café, in Betterton Street, just by Covent Garden hosts a wide variety of poetry evenings - their regular 'Poetry Unplugged' open mic nights are always worth checking out. As the official venue of the Poetry Society they also have a small mountain of poetry books and magazines to read, plus much information about poetry events across London. Apples and Snakes - dedicated to performance poetry, they put on multiple events across London and beyond. And they’ve got Fred D’Aguiar coming up at the Soho Theatre! He’s a superb live performer, and in fact one of the first poets I ever saw read, way back; when I was still at school - I’m booking tickets now. Poet in the City - relatively new on the scene, they’ve established themselves with some fantastic events at various City venues, with individual poets reading their own work or exploring broader themes through the poetry of others. Their website also has a useful guide to general London poetry events. 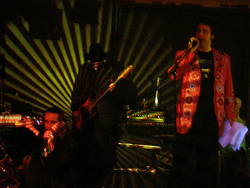 And there are many regular events that include poets, even if they aren’t exclusively about poetry; two particularly recommended ones are Book Slam, London’s literary nightclub, which usually has seriously interesting people reading, and The Klinker, which mixes sometimes challenging, sometimes stunning improvised music with irregular performances from some of London’s more experimental poets. And that’s not even beginning to scratch the surface. There’s so much more out there - check out the Books section of Time Out, for example - but really the best thing to do is to just keep your eyes open, and if something takes your fancy, head on over and check it out! Al Robertson is a writer and musician and author of the allumination blog. The image shows the author (right) reading with ambient metallers Graan at the Cross Kings in Kings Cross. Image by Heather Lindsley.